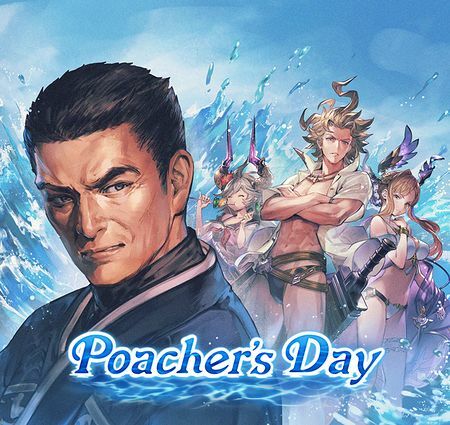 Poacher's Day is a story event. This event's plot is a continuation of the story from Gripping Freedom. home to breathtaking scenery and exotic sea creatures. 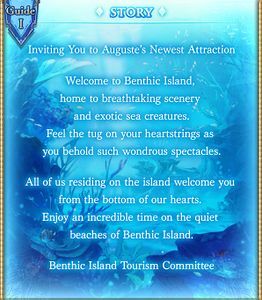 All of us residing on the island welcome you from the bottom of our hearts. Enjoy an incredible time on the quiet beaches of Benthic Island. Complete the daily mission every day. 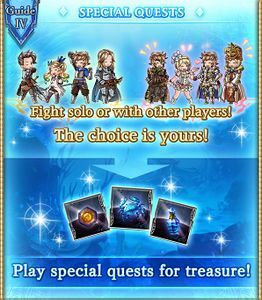 Purchase as many Premium Draw Tickets as you can. There are 3 in total. Purchase Damascus Crystals as they are a good long-term investment given their scarcity outside of events. Obtaining all three is recommended if AP/Elixir consumption is not a concern. 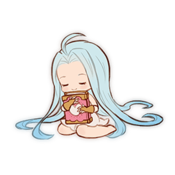 Purchase Coronation Rings and Lineage Rings if AP and EP consumption is not a concern. Urchin Fist is not as good as other EX Fire ATK boost weapons that currently exist, but is still a decent Fire element option for Melee-weapon classes. If you do not have any other EX Fire weapon, this weapon is a good filler until you can obtain better. Takes 25% more damage status effects. When fully uncapped, Urkin's call also grants RevitalizeRecover HP each turn. Boost to charge bar if HP is full. to all allies. For newer players, Urkin is worth keeping. only deals 2% max HP damage per turn and is easily manageable. Good Fire attacker for beginners. 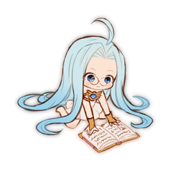 Carren (Event) joins you permanently after raising her loyalty to 500. 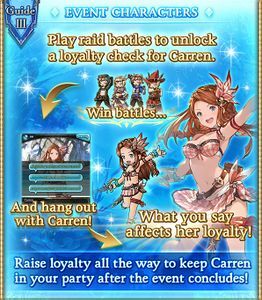 Clearing an event raid battle certain times after having completed the event story will let you play Carren's loyalty episodes. Talk with Carren during the loyalty episodes and give the right responses to raise her loyalty. Raise loyalty all the way to keep Carren in your party after the event concludes! You can also view loyalty episodes via the Journal screen once Carren has joined you permanently. Some loyalty episodes contain more than one set of choices. In these episodes, only the second set of choices affects the amount of loyalty earned. Let's Go for a Swim! Hehe. How 'bout that, (Captain)? Impressed yet? Isn't there anything better we can do? Swimming with you is so much fun! They're beautiful. The Fish of Benthic Island I learned it all from the fishermen! Bet you didn't know most of this stuff, huh? All hail Acting Captain Carren! Of course I did! Nope, you got me. Meal Time at the Beach What do you think, (Captain)? Meh, wasn't worth the trouble. This is so much fun. It's delicious. A Reprieve Do you think I'll be able to pay back the favor in full on this beach, (Captain)? That's up to you. You have a long way to go. You already have. Fireworks Show Haha! Wasn't that just amazing, (Captain)? I'm glad I got to see it with you. I've seen it before actually. It was beautiful. Sorry, does that seem weird? But don't you think it's beautiful though? Invite me again sometime. Not as beautiful as you. Sounds just like you to say that. Secret Attraction Revealed Whew, I had so much fun! How about you, (Captain)? Did you enjoy coming out with me to the beach? Yeah, it was all right. Definitely. Everything's a thrill with you, Carren. Fire damage to one ally. Multi-hit Fire damage to random allies. 12 hits of ~750 Fire damage to random allies. Big plain damage to all allies. Drop table last updated: 2017-07-09, all stated drop rates are estimates. Drop table last updated: 2017-07-09The game changes over time. If the drop tables become incorrect please notify the wiki staff., all stated drop rates are estimates. Normal attacks hit all allies. 6-hit Fire damage to random allies. 16-hit Fire damage to random allies. Plain damage to all allies based on 30% of max HP. Cost to Host: 0 AP Unlock: May appear after hosting Very Hard or Extreme. Always appears after completing Maniac. Clear the mission each day to get loot! A new daily mission begins every day at 5 a.m. (JST). 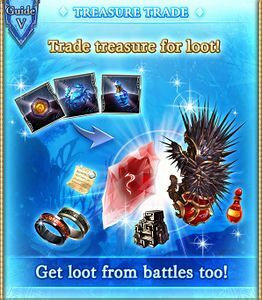 Mission rewards include Crystal ×50. Blue Sky Crystal ×1 is a reward on the last day of the event. Coronation Ring 1 3 20 15 - Recommended. Lineage Ring 1 3 50 30 15 Recommended. Damascus Crystal 1 1 50 30 15 Recommended. Premium Draw Ticket 1 1 50 30 15 Recommended. Steel Brick 1 1 50 30 15 Recommended. 20 total 10 - - Recommended. 50 total 4 - - Recommended. CP ×10 1 20 10 - - Recommended if you still need to unlock classes. Fury Pebble 1 10 15 20 3 Do not buy. Fury Stone 1 5 50 30 10 Do not buy. A custom piece designed by Korwa for maximum fun. It's made from highly breathable material that gives a tight, secure fit without constricting the skin; not even the strongest waves could accidently knock it off. In the extremely unlikely event of encountering deadly predators, the miniskirt automatically detaches as a decoy. An island of the Auguste Isles. Although its seas are relatively free of fish, it is home to a wide variety of macrobenthos—organisms such as shellfish, octopi, sea urkins, and more. On land you'll find nothing but fishermen, at least until Sierokarte's eagerly-awaited tourist development plans come to fruition. 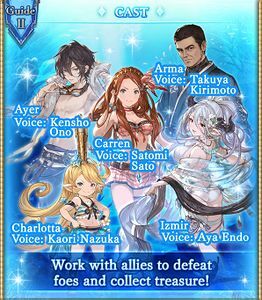 A few characters in the event exhibit slightly tanner skin tones as the story progresses. This page was last modified on 30 July 2018, at 08:56.